Our Production house Thousand lights Media Pvt Ltd is happy to announce that Legendary Director of Indian Cinema " Mani Ratnam " launched a song titled "love ante nenele " from our film "Anaganaga O Prema Katha" produced by K L N Raju , presented by K. Satish Kumar and directed by Pratap Tatamsetti . 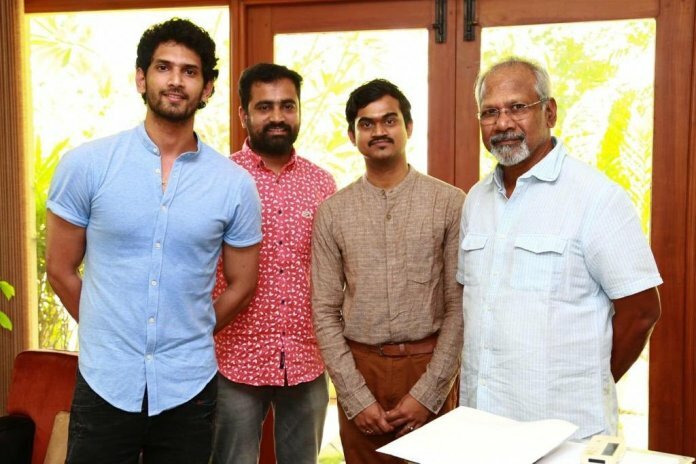 Genius director mani ratnam known for his excellence in move making has launched a Telugu song for the first time ever and congratulated entire team for the success of the film . We are honoured Maniratnam has launched our movie song , this itself indicates the success of our film , As a small film with new comers, getting a good response from entire film industry is making us happy . Producer K L N Raju specially thanked mani ratanam garu for the song launching . The song "love ante nenele " was shot in Malaysia with beautiful locations and this song was sung by Devan, lyrics by shree mani ,and music by K C Anjan . Anaganaga O Premakatha movie starring Hero Viraj Ashwin nephew of popular editor Marthand K Venkatesh who is also editor of this film ,Heroines Riddhi Kumar and Radha Bangaru , DOP : Edurolu Raju ,Art :Ramanajaneyulu.